What do you love best about a sports car? Is it the smaller design of a sports car's steering wheel? How about the premium materials on the steering wheel, dashboard, and seats? How about both? 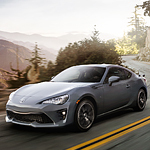 The popular sports car, the Toyota 86, is set with interior features that you'll love. The steering wheel is designed smaller than on a regular vehicle, making it easier to turn tight corners. And don't forget about the luxury of special materials and details, such as the contrasting silver stitching on the sports seats, the leather on the steering wheel, and the Granlux, a material that feels like suede, on the dashboard and door panels! If you feel like it's time to find the sports car that you've been looking for, come to Toyota of Laredo for a test drive and a private chat with one of our knowledgeable and friendly salespeople.